Our Stork with Baby Weathervane has served many purposes for many customers around the world, but the unifying thread is, of course, babies. 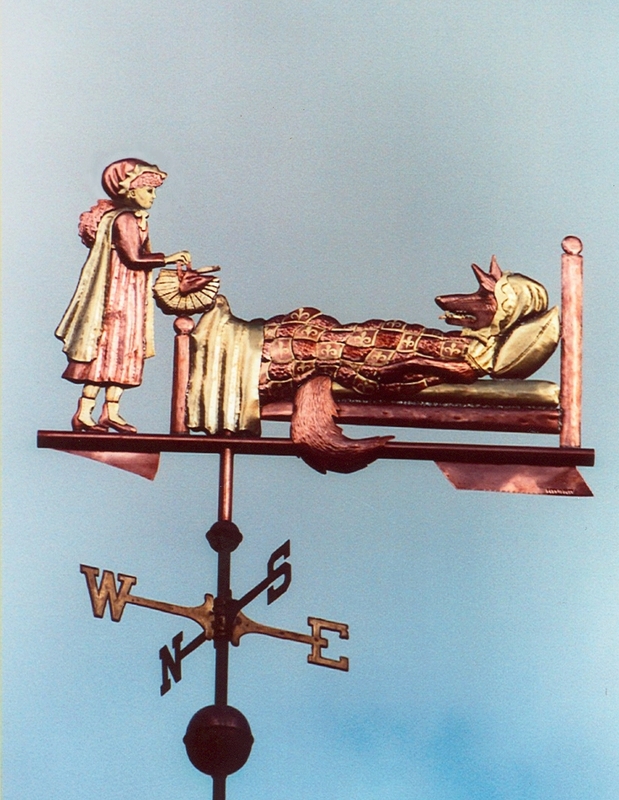 We have made Stork and Baby Weathervanes for maternity centers, obstetricians, and midwives — fulfilling a centuries old tradition of using weathervanes to advertise or celebrate one’s profession. For customers who live in high wind environments, we can lower the baby slightly so it can be secured to the nest for strength. Another option to vary the color is to insert wing panels in brass or nickle silver rather than use optional gold leaf. If you have questions or are interested in any of these design modifications, please give us a call. Also popular with families, one set of in-laws commissioned this piece as a wedding present for their children, hoping for luck and fecundity in their union. 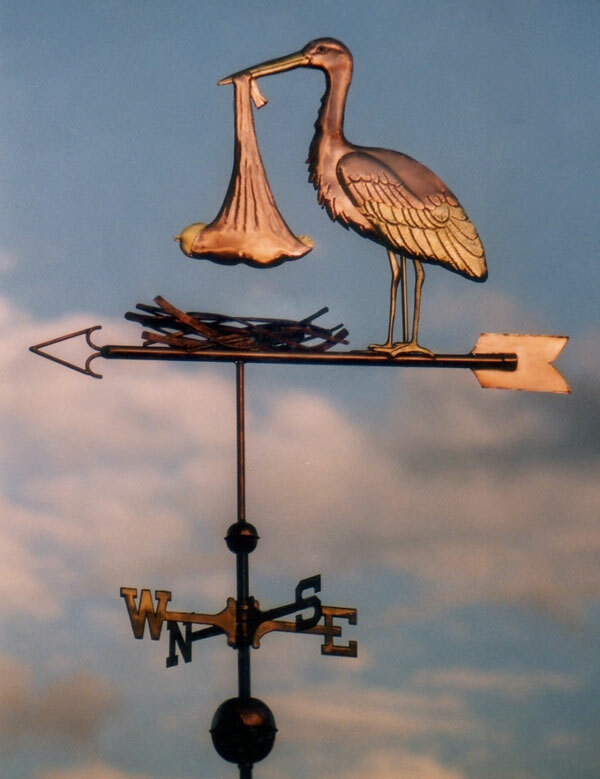 One proud papa presented his wife with a small version of this Standing Stork and Baby Weathervane after the birth of their first child. Inside the baby we placed a ‘lucky’ copper penny from the year of his birth and on the horizontal copper tube below the bird’s nest we stamped their son’s name and the date of his birth. Several years later this proud papa called us again. 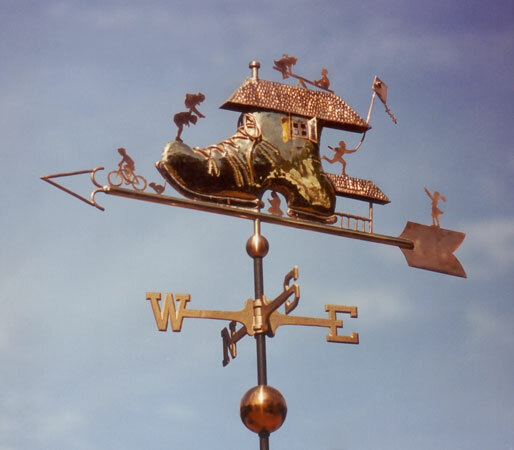 This time he ordered our Flying Stork with Baby Weathervane, also in the small size. They were celebrating the recent birth of their daughter. Again, we included a ‘lucky’ penny from her birth year and stamped her name and date of birth onto the horizontal copper tube beneath the flying bird and nest. 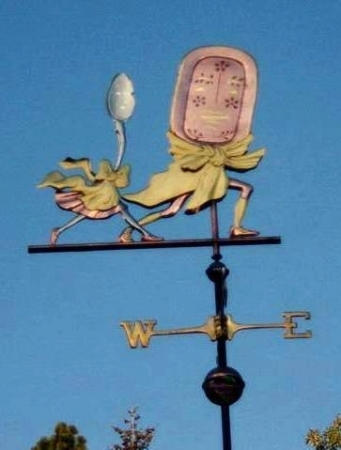 While the mother and father plan to enjoy the weathervanes themselves for the next twenty or thirty years, they will eventually hand them down to their son and daughter and they, in turn, hope they will pass “their” weathervanes down to their children and grandchildren. 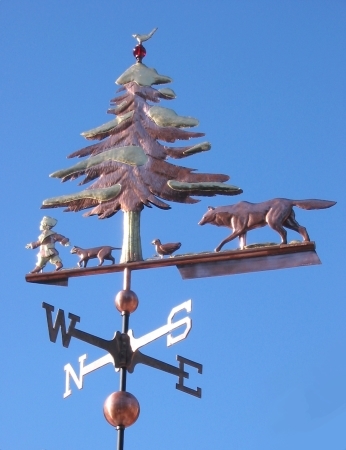 In the New England area there are copper weathervanes that have stayed in the same family for six and seven generations. 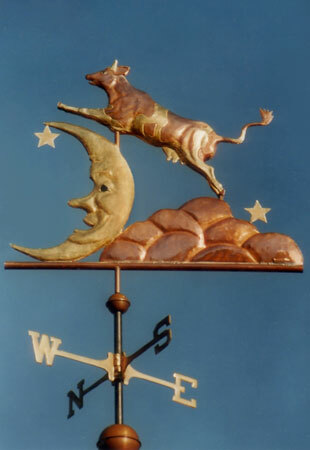 These special weathervanes are treasured family heirlooms as well. In Western culture the White Stork is a well known symbol of childbirth. In Victorian times the details of human reproduction were not a subject anyone would broach lightly, especially in reply to a child’s query of “Where did I come from?” Because storks were thought to be the harbingers of happiness and prosperity and were noted for strong family ties, returning annually to nesting sites on top of people’s chimneys, “The stork brought you” became the standard answer. One last story about what makes this such a satisfying business for us: In August 2009, we were contacted by a lovely woman named Lisa McCullum. She lives on the central Oregon coast and is a midwife by professional training. She was turning 50 and her mother wanted to get her a special gift to celebrate the occasion. 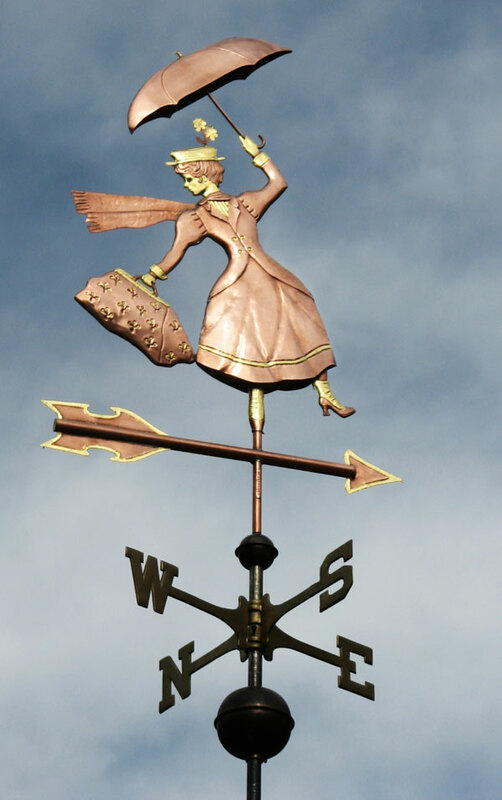 What she wanted was a Stork and Baby Weathervane. 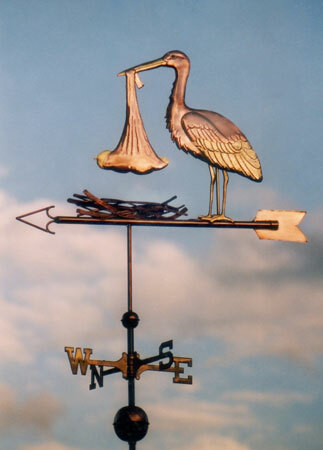 This Stork with Baby Weather Vane is a part of our Storybook Character Weather Vane collection. Custom copper weathervanes are part of our larger series of mythological weathervane designs that also feature Dragon weathervanes, Mermaid weathervanes and over 50 other mythological designs. You can visit our Mythological category pages to learn more about our other Mythological options.